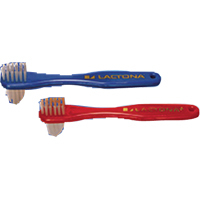 The GUM Denture Brush is recommended for the daily care of removable dentures and acrylic retainers. The brush consists of two differently configured brush heads: a flat bristled head for smooth surfaces and a single-tufted head for hard-to-reach areas. 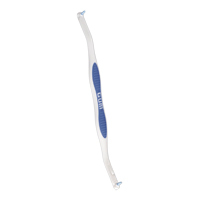 The strong flat bristles are extremely resilient and efficiently remove dental plaque, food particles and other debris from the inner and outer surfaces. 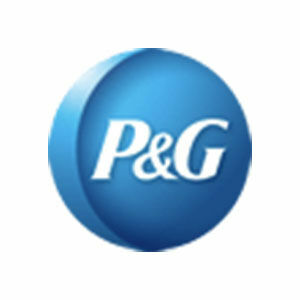 The single-tufted head consists of tapered bristles, which provide superior cleaning in the hard-to-reach areas regular. The GUM Denture brush has a comfortable ergonomic handle with lever-grip superbly adapted for people with limited dexterity. 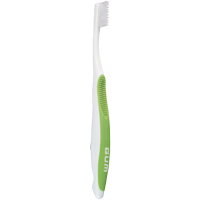 The textured handle provides wide thumb support and sturdy handgrip, which assists in easy and precise brushing.